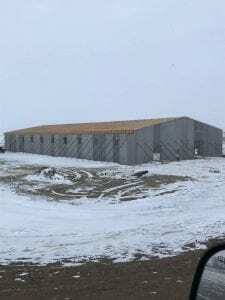 Sustained winds of more than 20 mph blew through Eagle Butte Saturday, Jan. 26 and Sunday, Jan. 27 causing extensive damage to the Cheyenne River Sioux Tribe Game, Fish and Parks Equine Center Project, a report released by WoLakota Construction said on Jan. 29. The sustained winds creates “a force called resonance on the structure which is a steady shake or vibration which can weaken a structure that is not complete,” the report said. 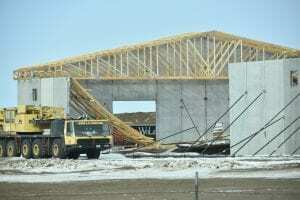 The WoLakota Construction company was contracted for the job, and said that they have the insurance to cover the damages, which included the collapse of “some 37 trusses” from gusts that occurred on Saturday due to wind gusts of 30 miles per hour. While the finished construction of the Equine building promises to withstand these kinds of winds, the building was only 60 percent complete, and so it was not yet properly braced with what the company explained is the “web bracing, purlins, bridging, metal panels at the roof and soffits” had not been installed yet.